We’ve reviewed Moneydance several times over the last few years, and as each new version appears we’ve seen significant improvements to the program. Moneydance 2007 proves to be a very good personal finance application with some features that rival Quicken. Unfortunately, the program still has a handful of interface oddities that can detract from its otherwise excellent features. Moneydance is a Java application that is fast, well-designed, regularly updated, and well supported, and which seems to have a very satisfied user base—superlatives not often used in conjunction with Quicken, the major player in the Macintosh personal finance market. The program uses a customizable navigation window—or home page—to put all of your personal financial information at your fingertips. The home page displays all of your bank account information, your credit card and loan balances, a calendar with highlighted transaction reminders, and stock values, as well as your current net worth and updated currency exchange rates. Any of these items can be rearranged or removed from the home page using the program’s preferences panel, and you can open most items—like your checking account—much as you would Web pages, by clicking them once. Moneydance uses a home page to give you easy access to all your financial information. New to Moneydance 2007 is a summary graph on the home page that allows you to see all of your expenses in a color-coded bar graph. The graph can be changed to display your income and expenses in monthly, yearly, and running 365-day views. Moneydance’s toolbar can now be configured to display selected budget information, and the application offers you the option of using extensions, small programs that you can download and add to Moneydance to give the program more features and functionality. 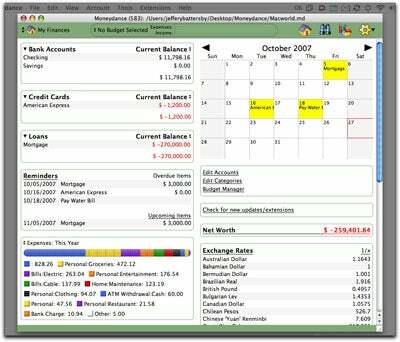 Like Quicken, Moneydance uses a checkbook ledger-like interface for adding new transactions to your accounts. You can enter new transactions manually, download files from your bank and import them, or create a direct connection to your bank and automatically import the files. (Moneydance can connect directly to a multitude of banks.) The program’s amount field allows you to add single dollar amounts or use complex calculations to enter dollar amounts. So, if you have several bills that you have to pay to one person, you can type in all the numbers, each separated by an operator, and Moneydance will handle the calculation for you. Moneydance offers excellent graphing and reporting tools that can be customized and saved so that they’re available with one click from the home page. It also provides support for multiple currencies; if you need this feature, this puts the program head and shoulders above any other personal finance program, including Quicken. Once you start entering data using the ledger, you’ll begin to notice some of the program’s interface quirks. For example, Moneydance lets you enter a duplicate check number in the check# field without a warning. And, if you’re used to adding a new transaction category by typing it in the category field, you’ll be disappointed to discover that this is not an option in Moneydance. While the program ships with a wealth of predefined categories, if you want to add a new one you’ll have to open the Edit Categories window from the tools menu and enter it there. I discovered several smaller issues like this throughout the program, including occasional screen redraw problems. While they aren’t deal killers, these details could be frustrating if you’re making the move from Quicken to Moneydance. Moneydance 2007 is a viable and worthwhile alternative to Quicken. While the program still has a few minor quirks and lacks some of the data entry features that make Quicken a perennial favorite, Moneydance offers nearly everything you need to track and manage your personal finances.